I've been a customer of Callwave a company that provides internet fax, voicemail, audio conferencing and a variety of other services. I've been paying them something like $10/year for a fax number that receives about 20 faxes a year (mostly junk). So I don't use it much, but it's a dedicated number that I've had on my business card for something like 10 years. Today I noticed that they had charged me $12.95/month for the past 3 months! A price increase of about $150/year!!! Nowhere on the form that I entered my updated credit card information did it mention the fact that they were raising my pricing by something like 1000%!!! Today I went to their site and discovered that apparently the old plan I was on was gone... I sent them a moderately irate email asking them to cancel my service AND refund the $38.85 that they had deceptively charged me. Instead I got a snotty/rude email response from Lenny Sanders a CallWave Customer Care Representative, informing me that they had sent me 2 emails in September explaining the new pricing policy, and that I could CALL THEM ON THE PHONE between sometime and sometime pacific time if I wanted to cancel my account. They could take the time to make a personal response to my email, but apparently they couldn't be bothered to actually act on it... WTF? The email they sent me in September had a subject line that started with "New fax features..." and were sorted into a junk folder. When I went back to read them today it is not at all clear that $12.95/month is the ONLY plan they now offer and they my pricing was going to change. Even if I had read it I would have no idea that I was signing up for $155 per year if I took no action. Deceptive marketing and billing practices. I am writing this blog post so that future Callwave customers can be informed about the character of the company before they consider doing business with them. I am disputing all past charges with my credit card company (I'm assuming that it will cost Callwave more money to deal with is than it would for them to just refund me the money they deceptively billed me). I will continue to blog about this topic until they refund my money and cancel my account. "would urge others not to do business with this company"
Callwave is a marketing scam and they are crooks. UPDATE 12/16/2008: Received another email from Janet Larson at Callwave "Customer Care" who says that they will be happy to review my refund request if I submit it in writing. I can email Callwave Customer Care at care-20@callwave.com to request cancellation and a refund. But wait... Janet works in Callwave Customer Care, and Lenny who emailed me yesterday works in Callwave Customer Care... but they can't be bothered to forward my email to themselves... instead they want me to write a new email to a different mailbox in their department? I'm a long time FolderShare user, and Microsoft just "upgraded" FolderShare to Live Sync. But it turns out the upgrade doesn't work on Macintosh... massive FAIL. 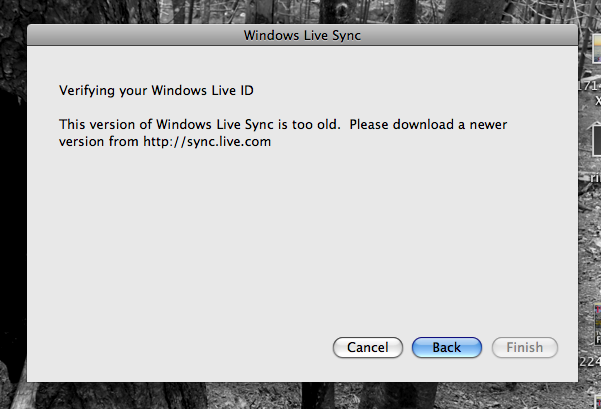 After installing the Live Synch client for OSX and trying to login you get the following message: "This version of Windows Live Sync is too old. Please download a newer version from http://sync.live.com. But this IS the newest version. connect to Sync again. We're sorry for the inconvenience. I've been really enjoying using Visual Studio 2008 and TFS for production development for the first time, but I hate the default file compare tool.